Ordinary number signature Leng high quality paper EF about 13,500 - 14,300 baht. Ordinary number signature Leng high quality paper VF about 9,200 - 9,700 baht. Ordinary number signature Leng waving line watermark paper EF about 14,500 - 15,500 baht. Ordinary number signature Leng waving line watermark paper VF babout 9,200 - 9,700 baht. 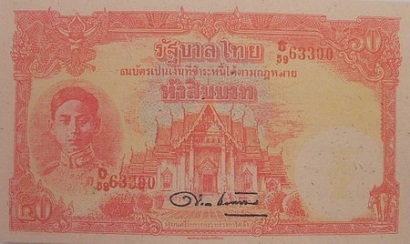 The 7th series 50 Baht Banknotes were announced on 23rd May 1945. 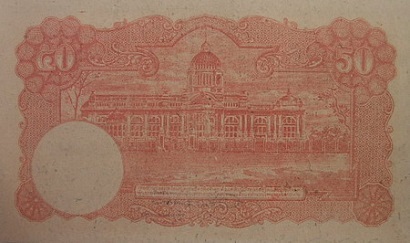 At first, the 50 baht banknotes were printed on high quality imported paper compulsorily purchased in the market. After this kind of paper ran out, the paper that produced by the Thai Paper Mill was used. The color of this low quality paper varied. This paper had a watermark of wavy lines. The main object is the image of King Rama 8 on the left. The middle image is the Marble temple. The serial code and number were printed with red ink.